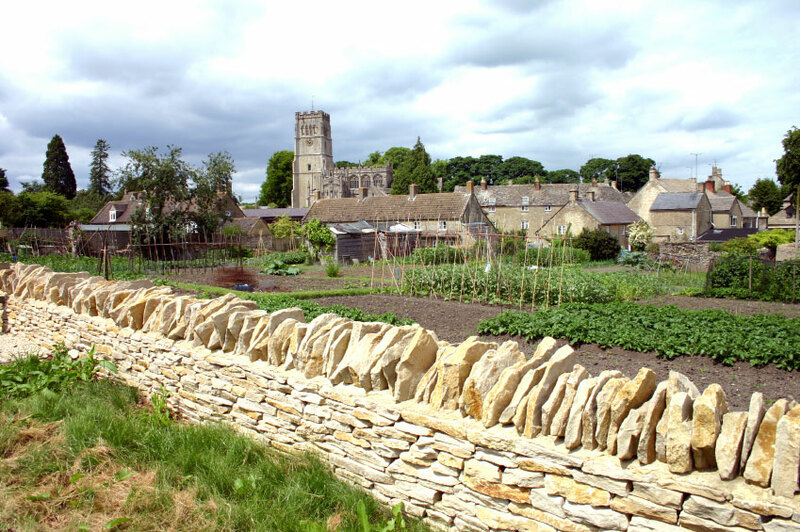 Northleach, which had its heyday during the fourteenth and fifteenth centuries as a wool-trading centre to rival Cirencester in importance, has often been labelled 'The forgotten town of the Cotswolds'. The Abbey of Gloucester acquired the land that was to be Northleach in around 780AD and developed it as a market town in the shape of a 'Y', with a market place in the fork and Burgage plots on the outside. The plots were large, so that the families who were to live in them could be self-sufficient, and many of the properties near the market place still have 'cow passages' between the front and back doors today. A church was built in the twelfth century, but it consisted of little more than an aisle. Wealth from the wool industry led to the addition of a chancel in the fourteenth century followed by a nave and sacristy in the fifteenth. Wealthy local wool merchants such as William Midwinter and John Taylor made sure that the church of St Peter and St Paul added pinnacled buttresses, a massive square castellated tower, an ornately carved font and rare monumental brasses. Permits for rubbing the brasses can be collected from the post office. The export of raw fleeces was banned by an act of parliament in the early sixteenth century and Northleach, whose river is not powerful enough to support a large mill, was left behind by the rush to export manufactured cloth. All that remains of this period of prosperity today is the disproportionately large and grand church. The town was given its charter by Henry III in 1227. It was to be allowed a weekly market and an annual fair. Although the market is long gone the charter fair still takes place every year, on the last Saturday in June, and the town continues to observe the annual ceremony of Court Leet in November. It is during the Court Leet that officials responsible for tasting the beer and the food are appointed, and a High Bailiff is elected by a jury, just as he would have been in the Middle Ages. Northleach is one of the very few towns in the country whose annual Court Leet has an unbroken record of meeting throughout the centuries. The town never fully recovered after the decline of the wool industry, although several very fine buildings remain. In the eighteenth century there was passing trade from travellers. The town was a convenient stop on the coaching route between Gloucester and London. The Sherbourne Arms, the Red Lion and the Wheatsheaf are all inns dating from this period that continue to function as pubs although the Old King's Head, the Tudor House and the Union Hotel have all undergone a change of use. Railways eventually spelt the end of coaches as a means of transport and once again Northleach, which was not on a railway line, was forgotten. In the twentieth century the arrival of the motor car again brought some passing trade to the town until in the 1980s a by-pass was built due to concerns that some of the town's old listed buildings were suffering damage from vibrations. Today's town has recovered some of its former bustling energy and supports a thriving local community, many of whom live in one of the several new housing estates that have caused it to grow dramatically in size. Shops and pubs are plentiful and specialist shops such as Keith Harding's World of Mechanical Music make it an interesting place to spend the day. The World of Mechanical Music includes a living museum with instruments being introduced and played by guides in a live musical entertainment show. The instruments include restored barrel organs, barrel pianos music boxes, phonographs, gramophones and antique musical clocks.